Found this little master piece the last weekend for a few bucks. Bought it cause in the back of my head I remember the TV Eye // Drummer been talking about it some years ago. Time Tunell is a track that you may want to place in the art punk category. But do we want to do that? No! Cause that may scare some close minded punk rockers(and we all know that punk rockers can be the most prejudice and close minded people in the evolution of mankind right) away. So lets just say this is great punk rock delivered with originality and great passion. Sweat comes as a bonus track cause it have some really great moments in there. I like this one a lot. Every time I hear “Time Tunnel,” I think of the Subhumans, but with Joe Jack Talcum doing background vocals. “Sweat” also reminds me of bands like the Subhumans and the Instigators. i really like this a lot too. have they released anything else maybe?? Yes, another single on Glass record, called Tannoy (extremely rare) and an album, both early eighties. Hey lou librium, ha ha saw jules the other week, how are you, greetings from the bass player-the subtitles also put out one track on a free flexi disc b/w the marine girls and given a way with vinyl? a dutch magazine, thats pretty rare as well. Later! yeah time tunnel is on of the greatest post punk singles all time in 79 its for all lovers of 77 punk post punk new wave great cover great record the other single are cool to but this is for my atention better ,thank you kbd. I love the English Subtitles. I have Time Tunnel, and Cars on Fire/Tannoy. Am an ex punk myself but somehow came across the singles and bought them after seeing English Subtitles sprayed on a wooden fence in Oxford in the early 80s ( while visiting sister one day) and the songs really grew on me especially Tine Tunnel. 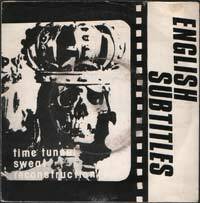 I went on to form and sing with a band..The Darkside, in the Midlands in 1986-1990 and have often quoted the English Subtitles as one of my rarer influences. Good Stuff, I still have the Subtitles singles and put them on now and then.